Currently, bio-production marks a major worldwide increase. More and more people start looking for and using bio-food, bio-cosmetics, bio-products for cleaning, losing weight, etc. Bio-production, on the other hand, is expanding in order to meet customers demand. The .bio domain provides a great opportunity for positioning of your bio-brand on the Internet. The .bio domain may also be used as short for biography, biology, biophysics, biotechnologies, etc. 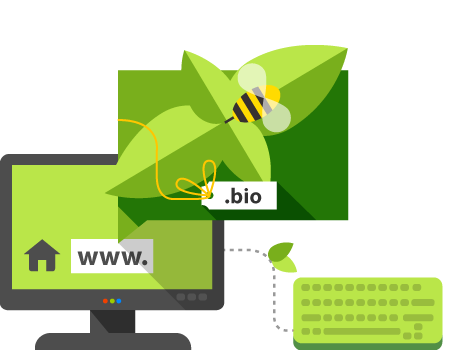 *With the registration of .bio domain names the registrant undertakes to respect "principles of organic farming," which are defined by the International Federation of Organic Agriculture Movements. If the registrant is a manufacturer or retailer in the field of agriculture and food, the registrant undertakes to comply with the principles of organic farming and all the provisions in force in the relevant markets where the registrant intends to present or promote their products within online content related to .BIO domain.